Remote start & security features provide ease to using your vehicle. These conveniences are a must-have among many vehicle operators these days and provide many safety benefits, too. In the Kansas City metro area, winters can get cold and summers are hot! Remote Start Systems allow you to start your car wirelessly to warm up or cool down your vehicle, so you never get in an uncomfortable car again! When you start your car from the indoors using a small keychain, you stay comfortable while the car warms up/cools down, and protects the engine at the same time. The car stays safe, too. The car will stay locked until you near the car and unlock the doors yourself. Handsets also remind you if your time limit is almost up and the car will shut off. While some vehicles are factory produced with remote start systems, our remote starters at Independence Audio-Video have greater range (up to two miles) and can even integrate with your cell phone so that you control your car from anywhere. Never get locked out of your car again! Our Remote Start systems integrate with your cell phones so that you can unlock your car from anywhere in the world. We offer a lifetime warranty on our Remote Start systems. 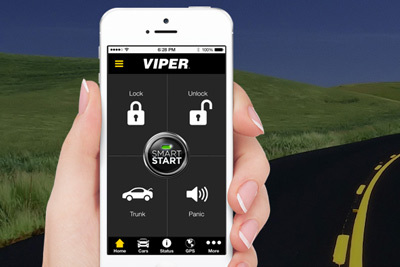 We carry Viper Remote Start and Directed Electronics Remote Start brands. We also offer vehicle security systems to ensure that your car stays safe and protected. Our specialized car alarms come with custom sirens to make different sounds so you can identify your car alarm. Unlike factory-produced car security systems, our products offer two-way communication paging when your car is tampered with or threatened. Not only will the car alarm sound, but your keychain will buzz and vibrate to alert you. That way you’ll know if it’s your car alarm going off in the middle of a parking lot when you’re shopping in the store. Our Vehicle Security systems offer superior range, allowing you to lock and unlock your car from further distances. We offer battery backups as well as a lifetime warranty on all vehicle security systems. Manage multiple vehicles and staff – or parent a teenager? You can monitor the status of a vehicle’s location, speed, activity and more with one of our Vehicle Tracking Systems. This option provides fleet and commercial vehicle managers a way to monitor safety and enable GPS tracking of each vehicle. We program your cell phone and/or computer to receive reports on all parameters you monitor. Tracking the speed your children are driving? Need to be alerted if a vehicle is sitting in one place too long or if multiple drivers are stalled together for too long? Want to know if a vehicle travels outside of a designated zone? We can program the Vehicle Tracking Systems to monitor all activities for your commercial and personal vehicles. We carry Street Eagle Vehicle Tracking Systems and U-Traq Vehicle Tracking Systems. Come into our showroom to learn more about how you can get started on your own vehicle tracking system, or call us at 816-252-9782.